on the Google Blog, Plesk now offers out-of-box integration with Google Services for Websites. If you’re one of the millions of webmasters already using Plesk Panel, you can now easily add high-quality search to your websites via the Custom Search page shown above. Since Plesk Panel knows what domains you own, a drop-down list of your domains is conveniently offered for automatic configuration of the search engine, as shown below. 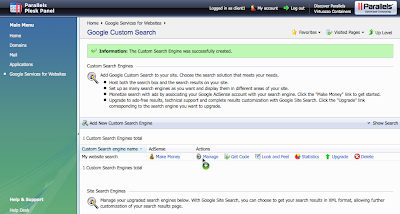 Once you’re done configuring your search engine, you can customize the search experience to match the look and feel of your website. As shown in the screenshot below, Plesk provides links that you can click to directly manage and customize your search engine with the Custom Search control panel -- you will be automatically logged in. After you decide on the theme and layout for your search, you can get the search code to insert into your website so your users can easily find what they are looking for. Finally, you can also click through from Plesk to access your search statistics. If you want support and more control over advertising, branding, and indexing, you can initiate an upgrade to Site Search right from within Plesk. 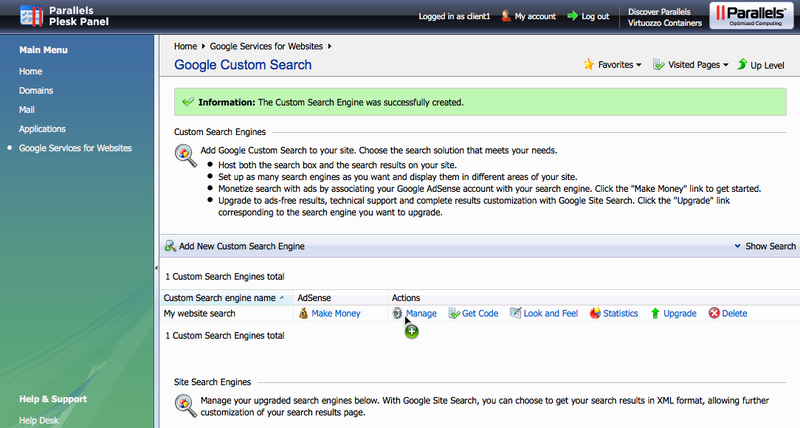 We hope this will make it easier for you to manage your site search experience. As always, let us know if you have feedback. Website owners who use Parallels Plesk Panel to manage their hosting and website services can now configure Custom Search and Site Search in a couple of clicks! As announced on the Google Blog, Plesk now offers out-of-box integration with Google Services for Websites.